In recent years, we have seen a great deal of media coverage about people across the country who are against the use of vaccines and having their children vaccinated. Much of this fear of vaccines is believed to have been advanced by a small group of celebrities who been outspoken about the issue. Jenny McCarthy was one of the most notable celebrities associated with the anti-vaccine movement when she implied vaccines could be responsible for causing autism in children. Essentially, all doctors and public health groups are strong proponents of vaccines for adults and especially children. They say there is absolutely no scientific evidence vaccines are responsible for autism or any other heath condition claimed by those not in favor of vaccines. These doctors feel it is tragic to allow any child to get a disease that could have prevented with a simple vaccine. However there is one potential health problem we have been seeing related to the administration of vaccines that has nothing do with the vaccine itself. It has to do with how the injection is administered. 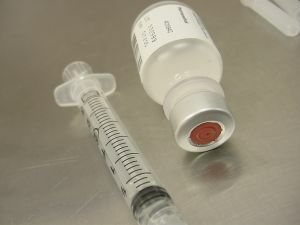 If the vaccine needle is inserted too high on a patient’s shoulder, it can result in a painful condition known as shoulder injury related to vaccine administration (SIRVA). People are now filing claims for these injuries, according to a recent news article from Wired. It is important to note that the risk of these injuries is not a reason to avoid taking vaccines, as they are necessary in preventing disease in adults and children. However, as our Boston personal injury lawyers can explain, federal law prevents these cases from being filed in normal civil courts, such as the Superior Court for Suffolk County. Instead, victims who are injured by the location of shoulder vaccine must file their cases, as with all other vaccine injury cases, before the United States Court of Federal Claims. In a look at the recent history of SIRVA cases filed, the court has agreed to compensate 112 victims for their injuries since 2011. While this does not seem like a very high number, it is important to note that around half of these cases were filed in the last 12 months, and this number is expected to rise as there is more awareness about SIRVA. The symptoms of SIRVA are pain and soreness for a prolonged period in excess of the normal pain and soreness often associated with intramuscular vaccines that lasts a day or two. One patient interviewed in the article went to her local pharmacy to have a vaccine and began to experience arm pain the night of her shot. The pain was present for months, and it hurt to the point she could not even lift her arm. She could not grasp things or use her arm in normal manner. She was worried the pain would never go away. Part of the reason fewer victims were compensated in the past was because defendants argued victims were making up the pain and suffering and that SIRVA was not real. However, it has now been recognized as a real condition verified by scientific evidence and this has helped many more patients receive compensation.